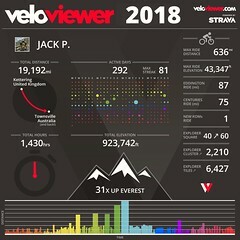 I have been a long term fan of the Veloviewer site which extracts your Strava ride data and provides so much more information. Some riders use it to monitor their KOM progress and performance, while my interest is more in the annual distance and route planning. 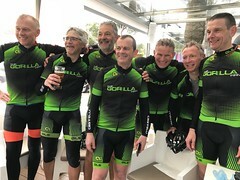 Last year the YCC ton of tons challenge and the introduction of an Explorer tiles count on Veloviewer inspired several riders to take up a new challenge. Put simply at map zoom level 14 the world map is divide into squares, or tiles. These are almost on a par with the 1Km standard UK explorer series map tiles but bear no resemblance to their location. When your uploaded Strava ride passes through any part of a tile, you have grabbed it, and it becomes coloured on your progress map. 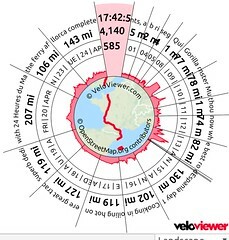 Your map is found on the Activities tab on Veloviewer. The colour set up is personally configurable, mine above shows the following. 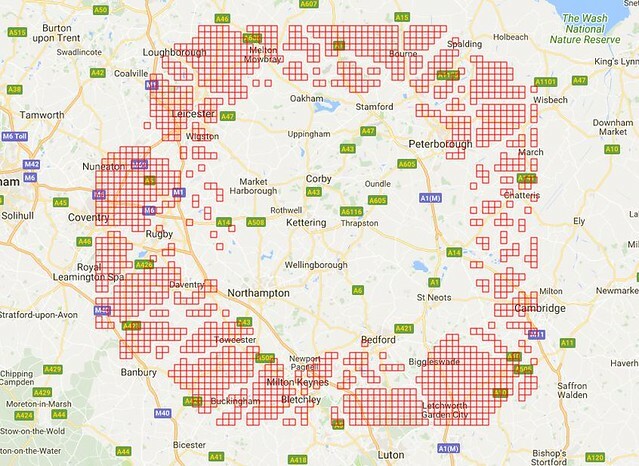 Red Lines are my rides spreading out from home throughout the Shire. Grey squares show the tiles collected by those rides, you can then see which unvisited tiles close by you need to visit. The Yellow splodge is your Max Cluster; A collection of connected tiles where all the other 4 tiles around it to the N.S,E,W have been visited. This was added in 2017 as some riders are physically limited from expanding their square due to the limitations of their location; seas, lakes, mountains etc. This has almost become a sport, VeloViewer provides leader tables for tile grabbers to aspire to and a Strava group Ride Every Tile for riders to discuss ideas has led to some great software tools to help. Completive without having to go fast, sign me up. Due to my length of time on Strava and the wanderlust I’m right up there on the all-time overall tiles visited, but it will take a concentrated effort to improve on the Max Square and Cluster scores. Big Kudos to Phill Cloke who I battled with for the first Ton of tons rider in 2017 who has covered such a huge area round London. Max Square Top 10 – 34×34 gets me 18th so far, so under half of the leader. Out on the bike it can be a trial to make sure that the square you are targeting has actually been reached, nothing worse than getting home to find out you didn’t go far enough down a muddy wooded lane. I used to add waypoints targeting a good way inside the square but this was tedious. Veloviewer have come to the rescue again by directly producing a KML file to view on google maps or a very good free App called Maps.Me. I have also converted the KML file to GPX format and used to view on the Edge1000. Out there with the Garmin I’m following the black line and the red grid overlay clearly shows I will just grab the Stoughton square no worries. I could have gone Right of my planned route to grab another using Stoughton lane as a quick in and out. The maps.me App on the phone takes the KML file link without fuss from VeloViewer and allows you to check your live position on your phone. The phone screen grab on the right shows the same view on my ride approaching Stoughton. Note the phones in airplane mode as the mapping is all free and offline, a very clear view of the squares that require grabbing. Be warned though you can get carried away just grabbing another tile and find yourself with a long route home. The KML shown on Google Earth. This graphically shows the common corridors followed for long rides out of the Shire, time to vary those established escape routes in future. The KML can also be used on Goggle Earth and GPXtoKML can be used to provide a quick share link to Google maps shown above. (It does have an expiry time limit though) I wonder how far a circular route round the outside of my cluster is, more planning to do. In planning rides I use Chrome as a browser and the excellent VeloViewer Chrome Extension for Strava extension. With this installed when you plan a route in Strava the unvisited tiles show up clearly which certainly encourages some diversions on longer trips. Planning a route to expand the Western edge of my square, Tiles to grab clearly visible. Note a 100 mile ride is the norm now to go grabbing. The UK view shows plenty or areas I need to explore more, as well as the common routes to fun. I have a very low Cluster score despite my large tile score because I ride away from home more. the big cluster score guys seem less adventurous. Maybe one day in the far future The Wash to the North East will impede my max square score, now that will be a huge score; Happy tile grabbing. Ben at Veloviewer has improved the Strava route plugin and you can export the KML direct from a Strava route planning window. It exports the KML for all the unvisited tiles for your current view. Hit the create button shown then it prompts you to export the file and can be used in maps.me or converted to GPX. Here I’m planning a Biggleswade attack. Nice article, thanks. The Explorer competitions are very popular here in Belgium – a huge cycling population and dense road network. You can see that the Belgians take about half of the positions on the leaderboards. Regarding the subject of always starting from home, it’s true that this increasingly becomes a limiting factor and you can make rapid progress if you travel to your target area first. This mode comes quite naturally to many, especially in Belgium, because so many cyclists are used to taking part in the countless cyclo sportive rides organised countrywide throughout the season. The rule we tend to follow is that the cycling hours should exceed the driving hours! This is, after all, exploring too 🙂 Whatever gets people out on a bike, hey? Big kudos for your own heatmap. Impressive! Hi Jonathon, the non density of the roads can be a challenge, and can be fun. I have a lot of off road to expand my square and doing 3 hrs just to get a new square is hard work in the winter. Up to 40×40 now and aiming for the veloviewer top 10 soon. This post is getting lots of hits too, which is cool. I will have to get over to Belgium again soon. How exactly are you doing that to have a clear view of all necessary squares on Edge screen? I converted the KML to GMX and moved to the NewFiles folder of my Edge100. It is not easy. I use the free application from Garmin called basecamp. You then draw round some or all of these individual boxes and create one track, Basecamp joins them together. its not ideal as it adds lines between boxes in a random manner, but it works. I then add that GPX to the Garmin1000 and colour it red and set to display onscreen always. This is where it gets fun. During one of the updates to the 1000 they somehow corrupted this display track on screen function. I had a supprt case going with garmin and they could not fix it; (very poor tech help team) After many months I gave up and demanded my money back as they had made my 1000 not fit for the use I had bought it for. They gave me a way to regress it to an older software version instead and it all works again. I just cant do updates anymore. So be warned the display on screen might not work for you. Would it be useful if I did a blog on how to use Basecamp for this in future? I use http://gpx2kml.com/ to create the GPX file, which as you say creates lots of individual GPX square files which the Garmin cannot handle. I use Garmin’s free downloadable program called basecamp. You can add a bunch of the gpx squares together to create one file. Its best to make this a small area that you are targeting. joining the squares does create some additional lines where it connects squares. Its not perfect though and I tend to check on my phone more using the excellent maps.me App.